Mrs. Buddha and I just got back from our annual pilgrimage to Negril, Jamaica where we had our fair share of jerk chicken, patties, and cold Red Stripe lager. Since the new year is upon us, and the holiday indulgences behind us, the first cook of 2017 features a healthy dish but one packed with flavor. One recipe that caught my attention in 2016 was a Filipino Chicken recipe I saw on my TasteMade iPhone app but never got around to making. This dish is easy to make, packed with vibrant flavors, and good for you. Now sit back, grab an ice cold San Miguel Pale Pilsen, and enjoy this post for Grilled Filipino Chicken Skewers. 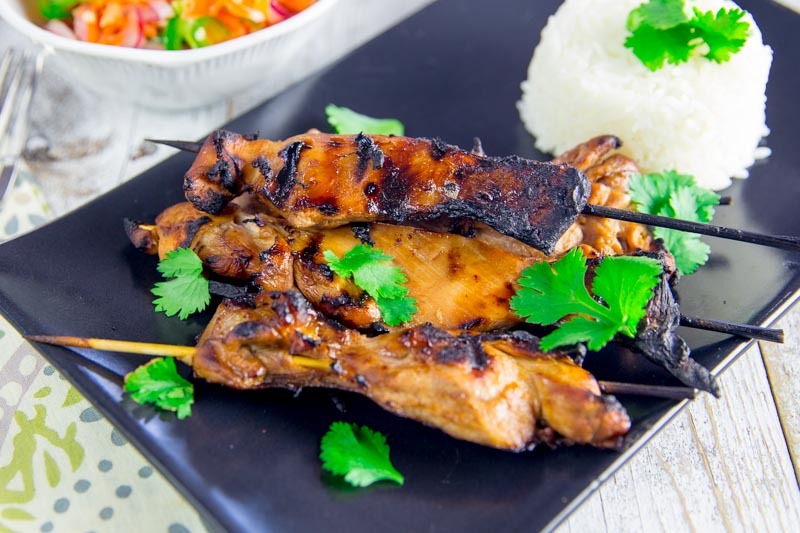 The ingredients for the marinade are simple and create a uniquely Filipino flavor profile. Lemon-lime soda, white vinegar, soy sauce, ketchup, garlic, and lime juice come together to form that sweet and tart flavor sensation. Clean and trim the chicken thighs before cutting them into thick strips for the skewers. After mixing the ingredients together place them in a Ziploc bag and into the refrigerator overnight. The next day remove the chicken from the marinade and place on wooden skewers that have been soaked in water for an hour. Preheat your Big Green Egg to 400° set up for direct grilling. Once the Big Green Egg is ready, put the chicken skewers on and cook 5 minutes per side or until the instant read thermometer reads 165°. Serve the chicken skewers with a pickled relish (recipe below) and steamed white rice. Enjoy! In a large bowl, combine all the BBQ ingredients. Allow the chicken to marinate overnight in a Ziploc bag. Preheat your Big Green Egg to 400° using a direct cooking setup. While the BGE preheats mix the vinegar, sugar, and salt together in a large bowl. Then mix in the rest of the relish ingredients. Soak wooden skewers in water for at least 1 hour. Skewer marinated chicken onto the soaked skewers. Grill direct turning occasionally to equally char and cook all sides. Serve with steamed white rice and the pickled relish.